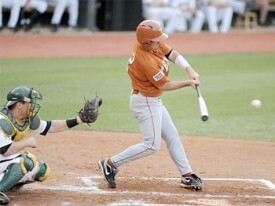 Behind 7 strong innings from starter [tag]Cole Green[/tag], the Texas baseball teamed open up 2009 College World Series play with a 3-1 win over [tag]Army[/tag] Friday at Disch-Falk. The Horns never put a crooked number on the scoreboard but thanks to Green’s pitching the 3 runs were enough for the victory. 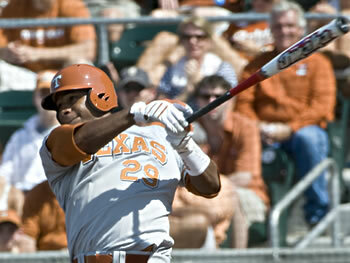 The win is a great start for the Horns in the double-elimination Austin Regionals. They will take on Boston College at 6 pm today, and if they can win again they’ll have two chances to advance to the Super Regionals starting Sunday night. [tag]Kenn Kasparek[/tag] pitched six strong innings but the offense couldn’t get going and Texas dropped the opening game of regional play to St. John’s 2-1. The team now must win three in the row to advance to the Super Regionals. The game was tied going into the top of the 9th inning when relief pitcher [tag]Cole Green[/tag] mishandled a ball hit back to the mound. He recovered on the play but first baseman [tag]Brandon Belt[/tag] couldn’t handle the throw and the St. John’s batter reached safely. Three batters later he scored the winning run as Texas failed to turn a inning ending double play. Head coach [tag]Augie Garrido[/tag] looked crushed by the loss in the post game press conference. I get the feeling that if this team gets swept out of the tournament he might call it a career. The team takes on Sam Houston St. in an elimination game today at 2pm.